Many people seem to really dislike this score - I have read things like "Horner's worst ever" about this soundtrack. Honestly, I really don't understand what they're talking about. Sure, this is not one of Horner's more original works. 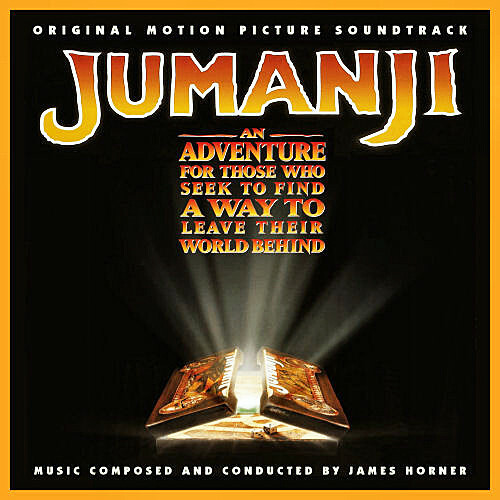 It's quite easy to pick out parts from other scores by Horner hidden in the music, like for instance The Spitfire Grill, Casper, Honey, I Shrunk the Kids and The Pagemaster. But that doesn't necessarily mean this is a bad score. 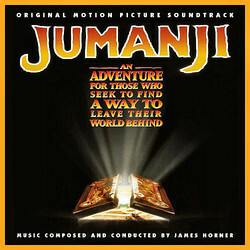 On the contrary, I think that Jumanji is a very good action score, with terrific supsense cues and softer moments. Many of the reviews I have read of this score describes Jumanji as one big piece of atonal and dissonant "music". This is not true. Apart from some dissonant music in the cue "Monkey Mayhem" the score concists out of almost equal parts of action/suspense and soft music - and nothing of it is just "noise". However, I can understand that people don't think of this as one of Horner's best scores. For example there is no real memorable theme present to tie the different parts of the score together, although there are a couple of different minor themes, and motifs that show up in different parts of the score, like for example the innocent and soft theme for Alan Parrish (Williams' character) or the short echoing trumpet motif used in many of the action cues. Highlights are "Alan Parrish", which is a soft cue featuring a precursor to the main theme for The Spitfire Grill (where talking about a striking similarity here); "A Pelican Steals the Game" with it's rapid staccato strings and light harpsichord; "Jumanji" - a terrific long suite which features wonderful, classic Horner, arrangements of all themes, with both action music and softer parts. If the whole score would have been like this cue, Jumanji would, without doubt, fit in with the other superb scores (Braveheart, Casper and Apollo 3) from the great Horner year of 1995. Probably the least inspiring James Horner Score I own. It is a bit of a compilation of ideas that he has already used (sometimes several times before) and usually in a much better way. It starts off with the faint choir like Willow and then moves through a selection of rather messy cues. The Pan Pipes and Sakuhatchi are all there, just like Willow. The main theme (which does occur, once or twice) sounds like something else, but I can't remember what. Probably the worst part (at least after a while) is the Monkey Mayhem music which is just a musical mess, I suppose it counters the visuals well, but on CD it doesn't make for good listening. This is one score that really should stay in the film, for the most part it is just loud and dull. Stick with Willow or Krull instead.